First, We Sing Songbook One is a collection of twenty children's songs, rhymes and games from around the world. Whether you are looking for new songs to add to your repertoire, or for new ways to teach familiar favorites, FIRST, WE SING is full of fresh ideas for the music class. 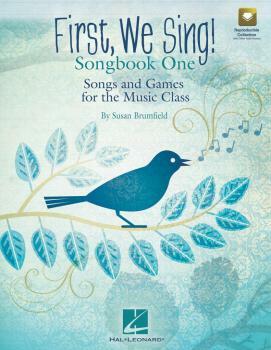 First in a new series of volumes designed to bring delightfully singable songs and practical pedagogy together in one anthology, this book is perfect for use in both home and school. Teachers will find extension activities for the classroom, historical references, pedagogical indices and suggestions for including the songs in a literacy-based music curriculum. First, We Sing includes suggestions for Orff instruments and recorder, along with seasonal and holiday songs, singing games and songs just for fun. Ideally suited for teaching musical skills, this collection provides a “vocabulary” of music and play from which children can draw today. Adults and kids of all ages will discover the fun and enjoyment of listening, learning, singing and playing these songs for generations to come. Available: Book/CD. Suggested for grades 1-5.